queensland public trustee exposed | Why would you trust the Queensland Public Trustee? 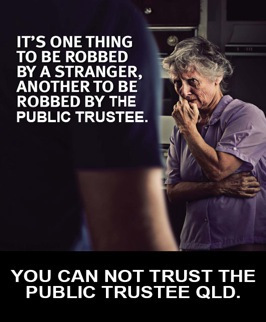 Why would you trust the Queensland Public Trustee? They took Ross away and they took his wife Ellen’s ashes too. They left his hat. Those that took Ross have a motto: ‘Protecting the rights of vulnerable Queenslanders’. We are concerned about the mental anguish they have caused Ross by taking him from his home. The Public Guardian refused to tell Ross’s carer or support people where they put him and would not give any reasons why. We have made written complaint to both the Public Guardian and the Ombudsman. We have complained in person to the Brisbane Manager of the Adult Guardian and to the Public Trustee. We have sought an order from Qld Civil Administration Tribunal (QCAT) for the Public Guardian to be removed as Ross Taylor’s guardian and that Ross be returned home. To no avail. Ross has been locked up in a high security RSL facility on the Sunshine Coast for six long months, over 100 kilometres away from his friends and supporters. None have responded to our questions or given reasons for their actions. Please show your support for Ross by adding your name to this petition to the Speaker of the Legislative Assembly in the comments box below. Your petitioners request that the Public Guardian return Ross Taylor to his family home where he feels safe and secure. We also request that the Public Trustee be ordered to investigate the fraud that has resulted in Ross Taylor losing his life savings and his family home.